Simon Weaver was going to sign for us two months previous to his eventual arrival here but instead chose to go to Macclesfield Town on loan. After Macc failed to offer him a permanent contract he was asked by Stuart Watkiss to join the Harriers. Luckily for us he agreed and hopefully his experience will help to ensure our place in the Football League for another season. 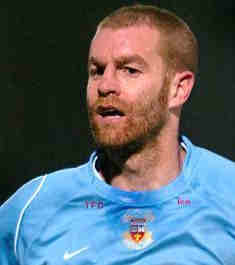 In the end it didn’t and he was released at the end of the season and joined up with Scarborough Utd a few weeks later. Simon is now the manager of Harrogate Town.